Despite the Mexicans being favorites and showing a bit more quality and flair during the first half, the South Africans, through good defending and solid play down the wings, with Teko Modise (Orlando Pirates) and Siphiwe Tshabalala (Kaizer Chiefs ,scored the goal) excelling for the home side. Still, a lack of concentration during one of the corners was enough for Rafa Marquez to get a point for the Mexicans who faded away during the second half, with Carlos Vela and Giovani Dos Santos responsible for a good and dangerous looking first but sort of weak second. France and Uruguay, facing each other in two hours, should be pleased. South Africa began taking initiative ever since, with Mexico’s goalkeeper, Perez, looking rather shaky when confronted with in swinging crosses. 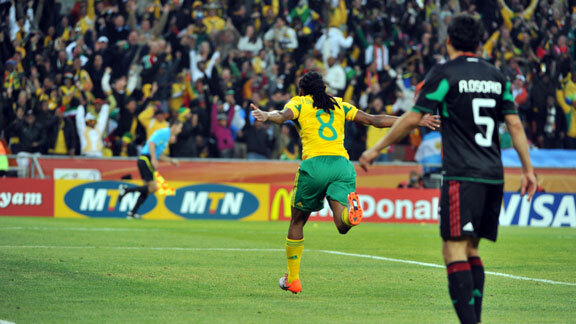 55th minute – Thsabalala scores the first goal of the 2010 World Cup, finishing a fantastic counter attack by the South African. Andres Guardado entered the match, maybe a tad too late, for Aguilar, right after the South African’s goal. Khule produced an amazing save in the 60th minute after Dos Santos released a fantastic shot from the edge of the box. One note about the South African crowd – They don’t cheer, no chants, nothing. Just those Vuvuzela’s the whole time. 69th minute – Oscar Perez saves Mexico from going 2-0 down, as Teko Modise hesitated while being hunted down by Rodriguez from behind. Mexico throw in Javier Hernandez for Guille Franco, hoping, along with Blanco, he’ll be able to save the day and get a goal from the Mexicans who don’t look too impressive in the second half, besides a few Dos Santos dribbles. Blanco doesn’t look like he can actually run. 78th minute – The first time Guardado was given some space, he delivered a very good cross which landed in Marquez’ lap, scoring the equalizer. Despite Mexico taking over since the goal, Perreira shows he’s not content with the draw, throwing in another striker, Bernard Parker, coming in for the disappointing Pienaar. 90th minute – Mphela finds himself alone in front of Perez with the slow Mexicans defenders chasing him, but found only the post with an agonizingly weak shot at goal from 5 meters.